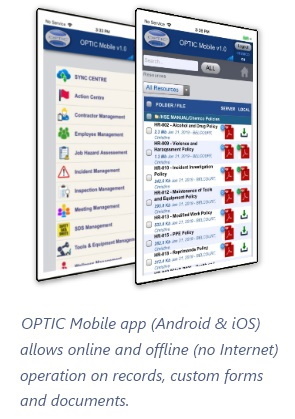 OPTIC Mobile app complements the Web application and there is no extra cost to use it - with the regular Client ID, User Name and Password used in the Web application. It operates on a subset of records downloaded from server to the mobile device, being a simplified version of the Web application. Custom (electronic) forms are supported as well. Documents (PDF, Word, audio/MP3, video/MP4, pictures, etc.) can be downloaded on the mobile device for later viewing with default application of the mobile device - when disconnected from the Internet. In a similar way, the records and custom (electronic) forms can be operated on while offline, with automatic or manual uploading to the OPTIC server when Internet becomes available. The performance of the mobile app is defined by the volume of data downloaded, adjustable through the app's settings.